The Big Brother Naija: Double Wahala winner, Miracle, was officially presented with his prizes including a cheque for 25 million naira, an SUV, a voucher for an all expense paid trip, and a premium home entertainment system today 30th of April 2018. The presentation was done at the winner’s press conference which held at the MultiChoice Nigeria office in Victoria Island, Lagos. 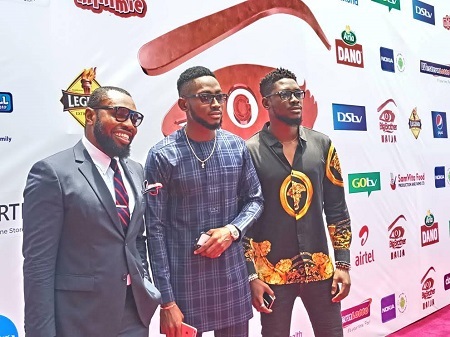 Also present at the event were other Big Brother contestants who, alongside Miracle, received DStv Explora decoders with a year’s free DStv premium subscription. The Managing Director, MultiChoice Nigeria, Mr John Ugbe, said, “MultiChoice remains at the forefront of empowering the Nigerian youth and all areas of the creative industry. Miracle is an example of the young, enterprising, resourceful, innovative and ambitious Nigerian youth. A trained pilot, his sojourn in the Big Brother house was an entertaining and endearing one as he won the hearts of viewers in Nigeria and across Africa. Big Brother Naija: Double Wahala premiered on the 28th of January, 2018. After three months of excitement, drama, suspense and a steady dose of trouble, the show which was hosted by Big Brother alumnus and talk show host, Ebuka, ended on the 22nd of April 2018, with Miracle, everyone’s favourite “flyboy”, emerging as the winner. Speaking at the event, the Regional Director, M-Net West Africa, Wangi Mba-Uzoukwu, said: “The Big Brother platform is indeed an important one as it provides the necessary spark to kickstart the careers of the contestants. Even though Miracle has deservedly emerged as the winner, we cannot ignore the fact all 20 housemates played ‘the game’ and entertained Nigerians.